Ground ice occurs in the pores, cavities, voids, or other openings in soils or rocks and includes massive ice (Plates 6.1 and 6.2). Ground ice is a general term used to describe all types of ice among which the following are distinguished (Shumskiy, 1959; Popov, 1967; Mackay, 1972&; Popov et al., 1985; French, 1996): pore or cement ice in the form of ice crystal particles which hold soil grains together; segregated ice which refers to icy layers and lenses in the soil; ice wedge ice; intrusive ice, such as sill and pingo ['Pingo' is an Inuit word from the Mackenzie Delta region, Canada, used to describe conical ice-cored hills] ice also known as bulgannyakh; buried ice, and icings ['Icing' is a sheet-like mass of ice forming either on the ground surface or on the surface of river ice]. The ice content of soils (rocks) is defined as a ratio between the volume of segregated and pore ice and the volume of soil (rock) and is expressed in per cent. The distribution of ground ice across Russia's cryolithozone and typical contents of ground ice in the uppermost 10 m-20 m of frozen ground are shown in Figure 6.2. Ice content varies greatly between 2-5 per cent in rocks through to 60 per cent and 80 per cent in soils (Regional Cryolithology, 1989). Several attempts have been made to classify permafrost according to the regime of freezing (Popov, 1962&; Shumskiy and Vtyurin, 1966). Epigenetic and syngenetic types of frozen ground are distinguished; this distinction is especially important in the context of cryolithogenesis. The former is characterized by the development of ground ice in soils and rocks after their formation; in the latter case, ground ice forms together with deposition of enclosing sediments. Cryogenic structure [In the Russian-language literature the term 'texture' is used to describe what North Americans denote as 'structure' (ACGR, 1988; French, 1996). In this text, the North American term is used] (aggregate shape of permafrost) depends primarily on geology and also on the regime of freezing determined by local terrain. Regional patterns of cryogenic structure correlate closely with the type of rocks and relief. For example, metamorphic and igneous rocks always relate to epigenetic permafrost. Cryostructures are closely related to the composition, genesis, and age of Quaternary rocks and sediments (Regional Cryolithology, 1989). Syngenetic permafrost forms under severe climatic conditions, in low air temperatures typical of regions where the Siberian anticyclone dominates in winter. MAGT below -5°C favours syngenetic freezing (although under shallow waters MAGT can be higher); such conditions are typical of the depositional plains of the Arctic islands, north-eastern and Central Siberia, the Taymyr peninsula and a narrow strip of coastal plain in north-eastern European Russia. Southwards, the share of epigenetic permafrost increases, and while on slopes, watersheds, and tablelands epigenetic permafrost predominates, in valleys both types of permafrost occur. Epigenetic permafrost is typical of the valleys of mountainous regions of Southern Siberia and the Far East. 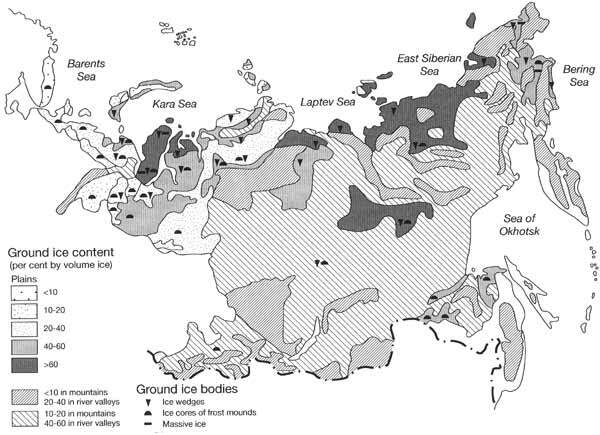 The maximum ground ice content and a striking variety of ground ice types occur in the low plains of north-eastern Siberia between the Khatanga and Kolyma rivers (Figure 6.2). 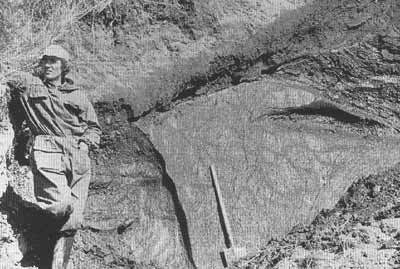 The predominant type of permafrost is syngenetically frozen alluvial, lacustrine, and slope sediments with ice wedges of Pleistocene-Holocene age (Popov 1962b; Shumskiy and Vtyurin, 1966; Dostovalov and Popov, 1966; Kudryavtsev et al., 19786; Regional Cryolithology, 1989). The accumulation of the enormous quantity of ground ice is due to the northern location of the region within a zone of continuous cooling, which occurred here since the late Pliocene; continental accumulation of sediments since the late Pliocene; preservation of permafrost during periods of relative warming in the Quaternary; and the absence of cover glaciation (Arkhangelov et al., 1989). The late Quaternary alluvial deposits (termed in the Russian-language literature yedoma) are a model example of frozen rocks in lowlands of northern Sakha-Yakutia. The alluvial yedoma sediments (here termed ice-complex sediments, ICS), with extremely high ice content are characterized by distinctive cryostructures and large ice wedges. The thickness of ICS reaches 35-40 m. The varieties of ICS alluvium can be grouped into three types according to their lithological composition: sand, silt, and silty peat. The first type has the lowest ice content of 25-40 per cent and ice wedges of 1.5-3 m in width which penetrate to a depth of 20-30 m. The third type is characterized by the highest ice content of 60-80 per cent and ice wedges which are 5-8 m wide near the surface and which penetrate to a depth of 40-60 m (Arkhangelov et al., 1989). Cryostructures of ICS sediments are composite. The thick-layered and small lenticular or reticulate cryostructure combinations with segregated ice thickness, varying between 2 cm and 3 cm (layers) and 0.1 cm and 0.3 cm (lenses), are typical of silty ICS. Massive structure is observed in sandy ICS; massive basal structure occurs in peat and peaty soils. There is still no consensus upon the genesis of ICS and hypotheses of its aeolian and alluvial origin are considered (Tomirdiaro and Chernenkij, 1987). Apart from ICS, syngenetic solifluction sheets, sediments in bogs and shallow thermokarst lakes and also contemporary alluvium occur in the lowlands of northern Sakha-Yakutia. Their ice content is also very high and ice wedges extend to depths of 5 m. Cryostructures of these polygenetic sediments (clay, silt, mud, muddy peat) are extremely varied: layered and lenticular structures which can be parallel or non-parallel, planar, wavy and curved, and also regular or irregular reticulate structures. Their size varies greatly, and thickness of ice layers and lenses varies from a fraction of a millimetre to several centimetres. Thus, lowlands of northern Sakha-Yakutia are unique with respect to the high ice content, variety of ground ice types, origin, age, territorial extent, and vertical dimension of frozen ground (Arkhangelov et al., 1989). The large syngenetic ice wedges are also typical of the taiga zone in central Sakha-Yakutia. Here, on the ancient alluvial plains and river terraces, ice wedges which were formed in the middle Pleistocene when climatic and sedimentary conditions favoured syngenetic freezing, reach 20-60 m in depth (Geocryology of the USSR: Central Siberia, 1989). The frozen ground is characterized by high ice content and diverse cryostructures from layered to lenticular and reticulate types with ice thickness varying between 0.1 cm and 2 cm. A wide extent and high content of ground ice is also typical of northern Western Siberia where epigenetic permafrost dominates. The most remarkable feature is a widespread occurrence of massive ice on the Yamal and Gydan peninsulas, which in the Russian-language literature is known as plastovy ice (an ice mass in the form of a stratum or sheet). Drillhole data and studies of natural exposures (Baulin et al., 1989) reveal that massive ice occurs usually at depths of up to 50 m (although depths of 200 m have been registered) with the absolute elevation of the ice-containing zone changing from +75 m to -100 m. Thickness of the massive ice bodies varies between 5 m and 40 m and they are usually bedded in Pleistocene moraine, littoral, glacial-moraine, glacial, and occasionally in alluvial, slope, and lacustrine-bog sediments. Most often, massive ice is overlain by clay-grade sediments and is underlain by sand-grade sediments. Outside the Yamal and Gydan peninsulas, massive ice exposures occur on the high banks of the Yenisey between the Arctic Circle and the delta. Two main theories are usually suggested to explain the origin of massive ice (Mackay 1970, 1989; Dubikov, 1982; Badu et al., 1982; French and Harry, 1990; Mackay and Dallimor, 1992; Baulin et al., 1989; French, 1996): (1) intrasedimental ice forms by segregation and intrusion caused by water migration processes; (2) buried glacial ice, without a clear distinction being made between glacier ice derived from snow and subglacier ice. Other hypotheses include lake, river, sea ice, and buried snowbank ice (Sukchodrovskij, 1979; Geocryology of the USSR: Western Siberia, 1989). Massive segregated-intrusive and buried glacier ice are similar in their appearance and it is difficult to differentiate between them in the field. In this case, the nature of the contact between the ice and the overlying or underlying sediment is fundamental. Dubikov (1982), Badu et al. (1982) and Baulin et al. (1989) consider massive ice to be mainly of intrasedimental segregated-intrusive origin, while Solomatin (1977), Kaplanskaya and Tarnogradskiy (1986), believe that it originates from buried glacial ice. All these theories and the results of field investigations of massive ice bodies are discussed in detail in Mackay (1989) and French (1996). In the northern areas of Western Siberia, both syngenetic and epigenetic ice wedges occur in the late Pleistocene sediments of river floodplains and terraces as well as in wetlands. Their thickness varies from 2 m to 6 m (contemporary ice wedges) to 8 m to 12 m (ancient ice wedges). Epigenetic frozen ground cryostructure is characterized by three main types (Dostovalov and Popov, 1966; Geocryology of the USSR: Western Siberia, 1989). A classic epigenetic type of frozen ground is characterized by an increasing thickness of pure ice layers, increasingly interspersed with frozen ground as depth increases. Correspondingly, ice content decreases from 40-50 per cent in surface layers through to 10-15 per cent at a depth of 40 m. Usually this type is found in clay, silt, and silty sand sediments. The second type is confined to silt and clay interspersed with sandy layers; the high ice content in silty clay (50-60 per cent) is a result of moisture migration from sandy beds rich in water. 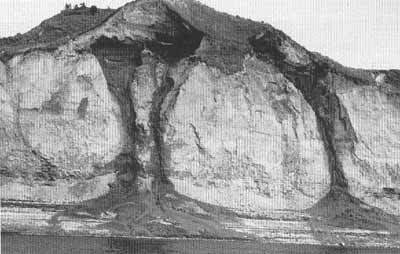 The third type incorporates both the first and the second types and occurs in sediments containing massive ice. Ice content decreases with depth from 40-50 per cent at the surface to 20-30 per cent, which is similar to the first type's distribution; deep underground ice content sharply increases up to 80 per cent on the contact between frozen ground and massive ice, which is caused by injections from water-bearing horizons into the freezing till or glaciogenic clay and silt. In other regions of Russia's cryolithozone, the distribution of ground ice conforms to the following regularities. The extent of syngenetic and epigenetic permafrost depends on climatic conditions, and is closely related to the genesis and composition of the Quaternary sediments. Medium and high ice content (40-60 per cent) occurs in the epigenetic glaciogenic clays of northern Western Siberia and also in the syngenetic and epigenetic fine-grained sediments of different origins found in the lowlands of the Chuckchi peninsula and the Anadyr plain. The same ice content is typical of the alluvial sediments of river valleys in the Siberian plateaux and mountains, which are characterized by low winter temperatures (Regional Cryolithology, 1989). Ice content decreases to 20-40 per cent in the middle Pleistocene glaciogenic clays of the European north and in the polygenetic sandy sediments of Western Siberia and the Taymyr peninsula. The areas without peat cover of massive-island and island permafrost zones are characterized by a low ice content that does not exceed 20 per cent. Epigenetic cryostructures predominate over other ground ice types. Within the permafrost zone, peat-lands, and frost mounds are specific intrazonal features which occur in many regions and are characterized by an ice content of almost 100 per cent. Polygonal peatlands with ice wedges occur in depressions and lowlands of the continuous permafrost zone. Their ice content is 60-90 per cent and the thickness of ice wedges varies between 1 m and 5 m.
There are various types of frost mounds which are distinguished by the type of ice core. Dome-shaped peat-lands (i.e., peat plateaux and palsas — mires composed of frozen mounds or ridges) are widely spread in the forest-tundra and northern taiga of the western part of the cryolithozone. They were formed by ice segregation, usually in the late Holocene after the climatic optimum (Geocryology of the USSR: Western Siberia, 1989; Regional Cryolithology, 1989). The height of palsas varies between 2 m and 5 m, sometimes reaching 10 m, and their cryostructure is of a nearly classic epigenetic type with maximum ice content (60-80 per cent) in the upper part of the frozen ground. Another type of frost mounds is the pingo (bulgannyakh). These are common in northern and central Sakha-Yakutia. Bulgannyakh ice core is of complex origin, produced both by the release of ground water under pressure from below and by segregation (Brown and Kupsch, 1974; Soloviev, 1973). The largest mounds contain ice cores which are 5-10 m thick; these are formed through the repeated injection of water. Heights vary between 3 m and 15m. Hydrolaccoliths (or open system pingos) are formed by the injection of sub- or intrapermafrost waters forcing their way through permafrost along faults without freezing en route (Brown and Kupsch, 1974). Their core frequently consist of pure ice which is 1-10 m thick. Hydrolaccoliths are particularly typical of Transbaikalia where permafrost and hydrogeological conditions, such as discontinuous and massive island permafrost, faults in the underlying bedrock, and the hydrodynamic pressure of underground waters favour their formation (Geocryology of the USSR: Southern Mountains of the USSR, 1989; Regional Cryolithology, 1989). Ground ice is the most unstable component of permafrost. The thawing of ice-rich frozen grounds is the most common effect of anthropogenic disturbance of the permafrost environment (Zotova et al., 1995).